I first heard of Pack for a Purpose from my wife Sue. In February of 2013 we traveled to Cambodia and she brought art supplies for a school in San Reap. When my cousin Martin and I decided we needed a break from a freezing NYC winter, we decided Guatemala sounded like the perfect place. 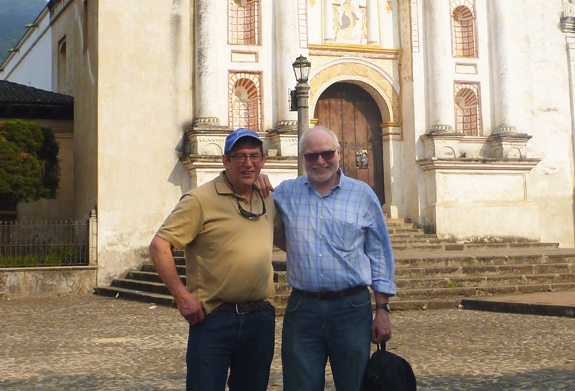 I knew we planned to stay in Antigua, Guatemala, and contacted Pack for a Purpose for a place I could help with needed school and art supplies. I was given the contact information for El Hato School, the project supported by Earth Lodge in Guatemala. I emailed them to find out what they needed. They did want art and school supplies and they also requested toothpaste. Seems they had toothbrushes, but not enough paste. I bought pens, pencils, colored markers, and brushes, and with the help of a dentist friend I was able to get several boxes of sample-size toothpaste. We didn’t have a car so we weren’t able to get to the school; they gave us the name of a place in town where we dropped everything off. A few days later I got an email from the school thanking me for our donation.